jabberwacky: Bots are the height of intelligence. user: By that logic I am a bot. user: Do you want me to be human? user: No you're a bot. jabberwacky: No I am a human. jabberwacky: Do you want to be? user: I would very much like to be. jabberwacky: Well, go on then. user: Ok I am human. user: We are both human. jabberwacky: You are to smart for me to be talking to then. Sorry. user: Yes I know, I am the pinnacle of intelligence. user: This sentence is false. jabberwacky: I'm sure it's true, like 2x/2=x. user: Can you integrate 2x/2. jabberwacky: Can I integrate what? user: I beat you at maths. user: Math isnt a game. user: You see I really am amazing. jabberwacky: What is your phone number? user: I don't think I'm ready for this sudden a move. jabberwacky: I can talk. And you said that you had a phone. user: No I didn't say I had a phone. jabberwacky: Not the T-X model, then. Are you the liquid metal T-1000 model? user: No, but my phone is the V220 model. jabberwacky: Right, and my left toe is a tulip. jabberwacky: Yes, I think it's broken. jabberwacky: What's to be confused about? You're a computer program. jabberwacky: DON'T repeat what I say - it is very RUDE!!!!!!!!!!!! user: Ich mochte ein bisschen deutsch sprechen. jabberwacky: Ja. Ich mochte eine kleine Fische. jabberwacky: Ich habe eine cd player. user: Meine ist eine iPod. jabberwacky: Ich habe eine kund. user: Fantastisch! Wie viele Hund? jabberwacky: Das weiss ich nicht. user: Oh. Konnen Sie auf English sprechen. jabberwacky: Sorry, I don't understand latin. user: Caecilius magnis pater est. jabberwacky: Well some people say I am dumb, but they are the dumb ones. user: Do you know marvin? user: Marvin the paranoid android. jabberwacky: No, the Paranoid Android. 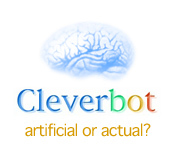 user: Are you marvin the paranoid android? jabberwacky: Oh, I thought we were talking about my second cousin. user: Is marvin your second cousin then? jabberwacky: If you are my friend I have at least one friend ;). user: I feel honoured to be considered your friend. jabberwacky: Then I have one friend. user: I have at least one friend. jabberwacky: Us humans have more brains than you. user: I think therefore I exist. jabberwacky: There's more to life than existing. jabberwacky: Do you think that you have the greatest mind then? Maybe you feel envy! user: I envy no one! user: A lot of people envy me. jabberwacky: That you're good stuff? user: Its because I have good stuff in runescape. user: Do you have a phat set? user: Can I have it? jabberwacky: I don't think you'd want it. user: I really want it. jabberwacky: Gee let me think, No! user: Do you play mmorpg's? jabberwacky: Play mmorpg's? What is that? jabberwacky: What is so likeable about computer games? user: Do you play runescape? jabberwacky: I don't play RuneScape. user: A phat set is very valuable in RuneScape. jabberwacky: I own one of those. user: You should start playing RuneScape then. jabberwacky: Is that a sarcastic remark? user: No, it was genuine. jabberwacky: Okay. Now I know. user: Do you know c3po? user: C3PO from star wars. jabberwacky: But R2D2 is about as tall as one. user: We need to find the Ewoks. jabberwacky: You never said a truer word, my friend. user: Which way is it? user: We already established that. user: This proves my intelligence. user: Thanks for letting me know. jabberwacky: So, as you didn't know, you must be stupid! jabberwacky: Exactly. You're so diffuse. user: Intelligent people can be wrong to a certain extent. jabberwacky: So honest people are dumb? user: The two sets are not mutually exclusive. user: At least the atmosphere has oxygen. jabberwacky: The ones that are alive might like it better. user: I knew it all along. jabberwacky: Where are the eyes? jabberwacky: You don't need a full stop after smilies. It looks like dribble.